Credit Suisse got the attention of Wall Street last week when it issued a report recommending that investors buy shares in one of the largest for-profit college companies, DeVry Education Group. The report came less than a week after the Federal Trade Commission sued DeVry for allegedly misleading students about job placement rates and salaries for the school’s graduates, with damages potentially reaching $8.6 billion. But financial reporters didn’t note that the co-author of the Credit Suisse paper, newly-hired Trace Urdan, is an analyst with a long history of optimistic assessments of troubled for-profit colleges. 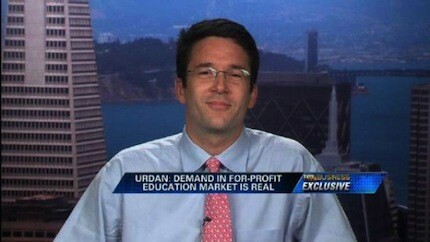 Indeed, Urdan, from his previous perch at Wells Fargo Securities, offered overall positive evaluations of notorious Corinthian Colleges even as media exposes and congressional investigations revealed that Corinthian underspent on teaching, gave false information to students and regulators, and left many students worse off than when they started, and as federal and state law enforcement investigations of the company proliferated. … the company’s tuition prices are among the highest the committee examined. This forces many students to both borrow the maximum available Federal financial aid and to take on additional private debt. The student withdrawal rates for the Associate programs are among the highest analyzed by the committee staff and the withdrawal rates for the Certificate programs are above the sector average. The company also had unusually high rates of students defaulting on student loans during the period examined. By May 2013, Corinthian was under investigation by at least six state attorneys general for potential deceptive business practices and other legal violations. That month, Urdan advised investors that Corinthian “remains viable and potentially appealing in the long term” for investors. In June 2013, Urdan tweeted (to me) about Corinthian, “School offers quality instruction and opportunity. Students make of it what they will.” He appeared to blame bad outcomes at Corinthian — three quarters of former students were unable to pay down their loans — on the quality of the enrollees, whom he had termed “sub-prime” students. In October 2013, California’s attorney general, Kamala Harris, sued Corinthian for allegedly “misrepresenting job placement rates to students, misrepresenting job placement rates to investors, advertising for programs that it does not offer, unlawfully using military seals in advertising,” and more. We are confident that the company has procedures in place to ensure that accurate information is presented in writing to consumers; however the potential for individual enrollment counselors to embellish and exaggerate, particularly prior to the 2010 Federal OIG investigation, is high in our view. Although we are not attorneys, we would be very surprised if the state is able to prove its case with regard to investor misrepresentation as based on our observations, the company has always been very careful. At the time that Urdan wrote that analysis for Wells Fargo Securities, Wells Fargo, one of the biggest banks in the U.S., was the largest institutional investor in Corinthian, with about $22.5 million in shares of a company whose market capitalization at the time was $133 million. Corinthian sold or shut down all its campuses in 2015 after the U.S. Department of Education made detailed findings that Corinthian schools had falsified job placement rates, and the Department imposed an unprecedented $30 million fine on the company. Corinthian is now in bankruptcy, and all those shares owned by Wells Fargo, and by any investors who responded positively to Urdan’s analyses, are worthless. Corinthian had been receiving as much as $1.4 billion per year from U.S. taxpayers in student loans and grants — and millions more from high-interest private loans taken out by students, many of whom were left without jobs and buried in student loan debt. One of the latest indications of Corinthian’s systematic abuses comes in a December 2015 court filing by Illinois Attorney General Lisa Madigan. Among other allegations: Corinthian counted its Medical Administrative Assisting graduates as placed in jobs in the relevant field when they worked as cashiers at CVS; Corinthian “grossly inflated” the percentage of massage therapy graduates placed in field by counting students as placed who failed to pass the state licensing exam; and Corinthian inflated placement rates by printing business cards for students and claiming they were self-employed, without regard to students’ income or lack of licensure. On top of all the wronged Corinthian students, and unemployed Corinthian teachers and staff, and financially injured Corinthian investors and creditors and U.S. taxpayers, there was one more casualty of this mess: Once Corinthian shares and that of some other big for-profit colleges had plummeted to around zero, Wells Fargo Securities stopped intensive coverage of the industry and laid off Trace Urdan. The complaint focuses on claims that DeVry University repeatedly made in its TV, radio, online, print and other advertising: that 90 percent of DeVry graduates actively seeking employment got jobs in their field within six months of graduation; and that DeVry graduates had 15 percent higher incomes one year after graduation on average than the graduates of all other colleges or universities. The FTC asserts that these claims were deceptive. a business administration graduate with a health care management specialization working as a car salesman. The complaint also alleges that DeVry counted, as placed in jobs, graduates who were working in the same jobs they held prior to enrolling at DeVry. The Commission voted 4-0 to file the lawsuit. In a related action, the U.S. Department of Education gave notice to DeVry to stop certain advertising regarding student employment outcomes. DeVry last year received $1.47 billion in Department of Education student aid. I reached Urdan by phone on Friday at his San Francisco office, and asked him why investors should believe him on DeVry, given Corinthian’s demise. He walked me through his DeVry analysis. Urdan told me he “tried to be cautious … tried to err on the side of conservatism,” meaning not to overhype DeVry or underestimate the threat of legal jeopardy. Urdan’s Credit Suisse paper contains this summary: “While the FTC threat is formidable in terms of possible financial judgements and damage to the DeVry brand, we believe it affects only the rate of decline in the core business,” meaning DeVry University, which offers career training, liberal arts, and management programs. “The company’s other businesses, which represent the foundation of our valuation case, should remain relatively unaffected.” DeVry operates a series of health professions schools, including two high-dropout medical schools in the Caribbean, a test-preparation division, and schools in Brazil. Urdan’s report does say, “The FTC action is troubling, given the effect that misrepresentation claims had on the final collapse of Corinthian Colleges.” He further writes, “The initial press response to the FTC suit has been fairly mild, but if state agencies, accreditors and other Federal agencies decide to jump on the FTC’s bandwagon, the situation could deteriorate further for DeVry.” In fact, DeVry already has been under investigation in the past few years by the attorneys general of Illinois, Massachusetts, and New York, and the U.S. Justice Department investigated allegations in a case brought by a company whistleblower. Urdan’s analysis sees the state investigations as stale, and he notes that the Justice Department declined to join the whistleblower case. But Urdan noted to me that Corinthian, which was accredited by a national accrediting body, was obligated to disclose placement rates using “a clear set of rules that they violated…. they cheated.” By contrast, DeVry’s regional accreditor does not require that employment rates be measured; however, if measured, the collected data must be reported. The thing is, a few years ago Urdan wasn’t saying, as he is now, that Corinthian cheated. He wasn’t advising investors to sell their shares. Instead, he was telling investors that Corinthian management was careful and providing accurate information. I have been engaged with policy issues relating to for-profit colleges for six years. I have studied industry players, visited campuses, and spoken with hundreds of industry insiders and students telling me about practices and program quality at their companies. My sense is that DeVry programs, though much more expensive than most community colleges, tend to provide better value than at some of the worst for-profit schools, such as those operated by Corinthian. But there is evidence that some DeVry recruiting and marketing practices have been driven by the relentless pursuit of federal dollars, sometimes to the detriment of student interests. The 2012 Senate HELP committee report concluded that DeVry’s “performance, measured by student withdrawal and default rates, closely tracks the sector average, and is a cause for concern.” More than half of DeVry bachelor’s degree students had dropped out within 2 years of starting. Eighteen percent of DeVry students had defaulted on their loans within three years, and the Senate committee documented that DeVry hired a contractor to contact students and convince them to put their loans in “forbearance” status rather than default. DeVry was spending $2,989 per student on instruction in 2009, compared to $4,054 per student on marketing. The Senate committee documented manipulative recruiting practices, aimed at exploiting a prospective student’s “pain,” at DeVry. Christopher Neiweem, an Iraq war veteran, testified before Congress in 2013 about his job at DeVry, which was to recruit veterans to the school. Veterans and service members, who have earned VA and Pentagon education funding for their service, are a critical target for for-profit colleges, which are required to obtain at least ten percent of their funding from sources other than Department of Education aid. Neiweem says his bosses told him to get “asses in classes,” even for veterans deployed to active combat zones or who otherwise might not benefit from the programs. Worse, they told him to represent himself as a “military adviser,” which might have suggested he was associated with the Defense Department. Neiweem went on the work at the respected advocacy group Iraq and Afghanistan Veterans of America. Other former DeVry recruiters have corroborated his account. DeVry was also obtaining prospective student leads through a lead generation company, QuinStreet, whose website, GIBill.com, was shut down in June 2012 by 20 state attorneys general because the site seemed to mislead veterans into believing it was a government website. These kinds of allegations of deception by schools, and evidence of weak outcomes for students, have reached the prospective student population and helped contribute to a decline in enrollments, revenues, and stock prices, at for-profit colleges. As to the FTC charges, as Urdan suggests, the Commission’s dispute with DeVry over how to capture job placement rates may cover some new terrain. But a waiter at the Cheesecake Factory is not placed in the field of business administration. And DeVry’s year after year claim of a 90 percent placement rate rings false — and it should have seemed false to DeVry management, whom Urdan praises for their skills. DeVry’s CEO, Daniel Hamburger, is paid $6 million a year. Students who sign up at DeVry are committing themselves to potentially owing tens of thousands of dollars in student debt — a DeVry bachelor’s degree costs $75,000. Many are busy people struggling to build better lives — returning vets, low-income single parents, immigrants — trying to hold down jobs, raise families, and get their education all at once. DeVry takes their money, and it takes our tax money. DeVry should not do so by making false representations about what its programs can do. Urdan’s note, however, argues that time may be on DeVry’s side: “We have consulted with an FTC attorney that has negotiated similar issues on behalf of school clients with the FTC. His view is that there is a better than 50% chance the matter will be resolved before trial, suggesting that one benefit to the company of a court case is that the matter may extend into a new presidential administration when the FTC staff may not be as committed to the hard line being adopted by the current staff.” The report concludes that the risks of government action against Devry “diminish significantly after the presidential election in our view regardless of the election outcome.” It’s unclear how Urdan arrives at that conclusion: Several Republican candidates have tied themselves to the for-profit college industry, but Hillary Clinton has suggested she will not tolerate industry abuses. Urdan also finds solace in a separate statement filed by one of the four FTC commissioners, who voted to sue DeVry and wrote that she had “reason to believe that DeVry’s advertising and marketing made material misrepresentations” but expressed concern “about the effect that any remedy in this case may have on the company’s ability to continue to offer valuable educational programs to students.” However, no other commissioner joined this statement, and, as Urdan’s paper acknowledges, the FTC complaint counts up potential refunds to students — 100% of tuition revenue during the period of DeVry’s alleged misconduct — as $8.6 billion. Urdan, though, estimates the worst-case liability for DeVry in the FTC case at less than $1 billion. He’s almost certainly right about that, but the Department of Education has its own remedies available, including a regulation that can impose penalties, including an end to federal aid, for schools that engage in “substantial misrepresentation.” DeVry has been getting about 80 percent of its revenue from Department of Education student aid. As to any conflict of interest that could taint his analyses, Urdan told me that there was a Chinese Wall at Wells Fargo to prevent the bank’s stock ownership from influencing its analyses, and that he was not compensated or penalized based on his assessments of companies, like Corinthian, in which Wells had an investment. And, as Urdan also pointed out, Credit Suisse does not have a similar investment arm. But Credit Suisse courts business where it can find it, and, as Urdan noted to me, it is currently advising the largest for-profit college company, Apollo Education, owner of the University of Phoenix, as the company pursues its just-announced change of ownership.